Here we go with the poster review of 2.0, which was released yesterday (21st November) at the First Look poster launch event in Mumbai. The first poster featured Akshay Kumar in a devilish avatar, which looked very much intriguing. The poster evidently shows that Akshay plays a crowman in the film, thanks to the detailing given in his hands and eyebrow. The second poster had Chitti and Richard (Akshay Kumar) facing off against each other, which indicates that we are going to witness one of the deadliest good vs bad fight between the duo. Though we have seen similar kind of face off posters in Hollywood films, this one teases the audience and excites the curiosity factor. The third and final poster showcased Chitti wearing his coolers and robot jacket, which were very stylish. 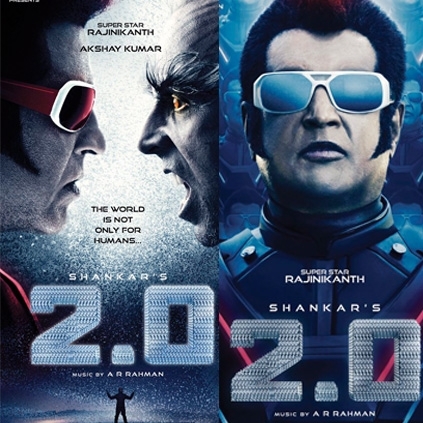 The backdrop of the poster is filled with identical images of Chitti. This helps us to know that there will be thousands of robot formation scenes in the film, just like the first part had. All the three posters have indeed taken the social media by storm with its intriguing looks. People looking for online information on Akshay Kumar, Enthiran 2, Rajinikanth, Shankar will find this news story useful.